Thursday’s Girl learns new tricks! ≈ Comments Off on Thursday’s Girl learns new tricks! The Secretary for our directorate has taken two days off and it turns out she knows how to do everything!!! Today I finally learned how to transfer calls around the office (something I’ve not figured out in the last 4 weeks) and how to book meetings using Microsoft Outlook and the City of Stirling Calender Server. 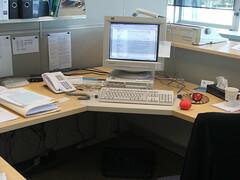 Here is a photo of my temporary desk that I have posted on Flickr – there was a librarian in one of my groups, who wanted to see other librarians desks. I made some witty little comments about it as notes and to read those, you’ll need to click here and move your mouse over the image.